This is part one of this series, you can jump to part two by clicking here. 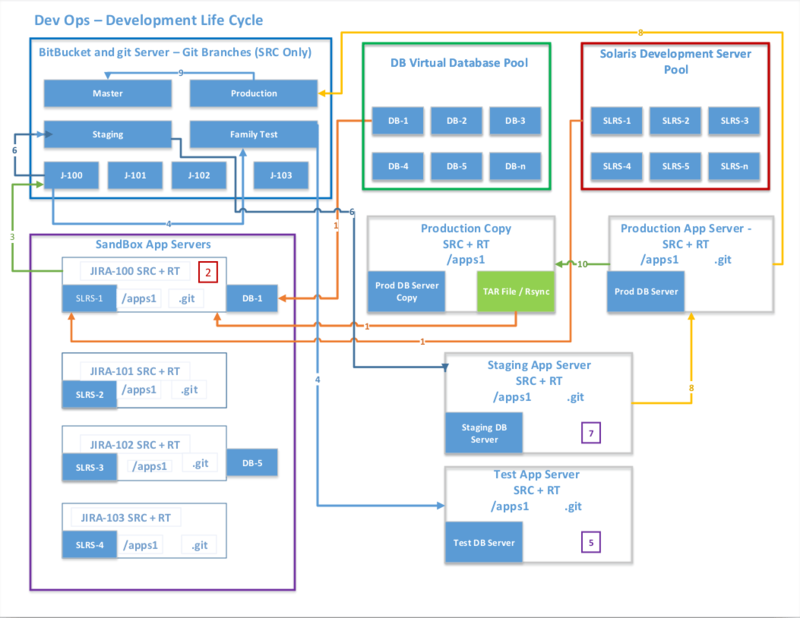 The other day I was challenged on a Solaris environment to create a DevOps like workflow for a large C-application. The application has needs that can not be addressed by using Git (we will still be utilizing git for some parts of the project), some of the challenges are outlined below. Note: Solaris dose not currently have/support a Docker (or alike) application. The application in question is a C compiled application with thousands of interdependent programs (3000-5000). Also to note, we are using Jira for application bug tracking. We would like to generate a full working copy of the application(s) every time a new jira request / bug is opened. We would like each developer to work independently on his copy of the code (and DB) with out affecting other developers. Why not use Git to do all this (we will still use to do a git pull). Every time a developer creates a new breach it would take a very long time 30+ minute’s due to the nature of our interdependent app. Since the source plus compiled code are all on a ZFS file system (NFS on a ZFS appliance) running in a Solaris Zone, we came up with the idea below. Every Jira request/bug will run the below wrokfllow. Once created/resolved remove/delete the VM plus ZFS file system. Utilize Solaris RAD API calls. To create a clone of the original Solaris Zone. To create a snap then clone of the original ZFS file system. Boot the Zone and mount the cloned ZFS file system in the new Solaris Zone. We call this, the poor man’s DevOps workflow. Note: We will still utilize Git to do a selective pull from each developer to a central coding area (we might choose to pull from more then one Jira bug for testing). Once ready, will pull the combined code to the master branch, which will trickle down to our prod branch. An image illustrating the workflow is below. All the code is available on my Github repository here. Enough talk let’s get to the real thing. Let me try to describe the environment. On the Solaris Global Zone, will be using a private switch (etherstub) for all zones. To communicate from within the zones to the outside Lan we will be using NAT and routing/forwarding. To communicate from the out side Lan to one of the zones will be using port forwarding. Will be using the Solaris firewalld application to do all that. All the cloned zones will be receiving there IP address from the global zones DHCP server. We will also create a static IP to Port mapping list so we know which port forwards to which IP address. We will be preparing all of this below. The script will then be utilizing all of this as part of the cloning process described below. Note: All of the code is available on my Github page here. To help and better understand I created a network digram below. Lets create a private switch (etherstub) with a local link, you do so by running the below. Note: The Ip Address of 10.25.0.1 is your router to the outside world or your local Lan. Next, Turn on ip routing/forwarding on the new switch/etherstub. Now, lets create the firewall forwarding and NAT rules, you do so by creating the below. Next, We need to enable the firewall service. this is used for nat and port forwarding. Create a DHCP configuration file with the content below. Next, enable the DHCP service. you do so by running the below. In part 2 Will continue to configure the source zone and SMF services. you can jump to Part 2 by clicking here.